Grailum Ltd offers 5 forever investment plans from 1.1% up to 2.2% daily. The investment offer is divided into 5 levels, that slightly differ in terms of min and max investment. The earning levels are divided as follows: Level 1 ($50-$1200) offer 1.1% daily, Level 2 ($1200 - $2500) 1.3% daily, Level 3 ($2500-$7500) 1.6% daily, Level 4 ($7500 – $15 000) 1.9% daily and Level 5 ($15 000 – $250 000) 2.2% daily. Initial deposit is included in the payments. If you want to quit the program earlier, the deposit can be canceled after 12 months. The minimum investment in the program is $50, but the maximum is not set. The minimum withdrawal for USD is $1, the minimum for coins is equivalent to $10, however, withdrawals for BTC can contain only a three-decimal number, for example, 0.111, therefore the minimum withdrawal for BTC is equal to 0.002. Withdrawal requests at Grailum Ltd for USD and BTC are processed instantly. The program accepts Bitcoin, Bitcoin Cash, Perfect Money, Payeer, Ethereum, and other payment methods. 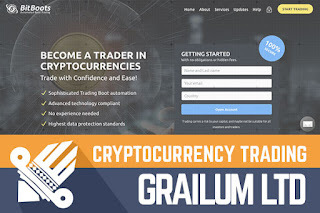 Grailum Ltd is one of the HYIPs built upon the cryptocurrency trend. Basically, the program offers an auto-trading system that is doing all the trading for you. Namely, within a few clicks, anyone can become a cryptocurrency trader by making a deposit into the BootTrader (or to put it simply - by choosing one of the five investment plans). So, the main thing for Grailum Ltd is the trading software BootTrader and they have come up with a few appealing selling points to advertise it on the website the first one, no settings needed, the second, no experience needed the third that I enjoyed the most: “no more watching the exchanges, glued eyes to the screen and making gambling on your own”. I’m sure we all know that this statement is fairly close to reality. 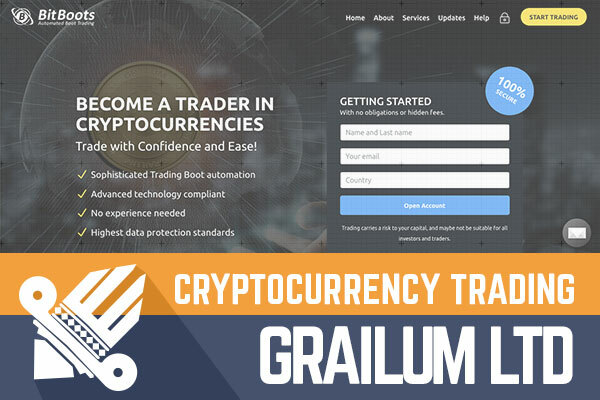 As a true cryptocurrency inspired project Grailum Ltd also offer a few additional services like Grailum Coin sale, Coin Exchange and Sleeping Coins. To find out more about the BootTrader and the other services, feel free to browse the website. Regarding the website, I have to say this one is a genuine a HYIP website. Yes, the layout, the color scheme, and the images and visual elements are standard and seen before, yet the website creates the right feeling. It’s a cryptocurrency trading program, after all, it should give this feeling of something distant yet easy to join. Another feature in this regard, at first I hated the login verification and account login emails. However, this feature also creates the right feeling – you have to make some effort to access the BootTrade and the admins take care of the user account security. In terms of content, this is not the most informative website. The admins could have done a better job with the Help page (FAQ) to properly cover the most important information regarding min., max. investment and withdrawals and the BTC withdrawal restrictions. They have even skipped the standard team description. Moreover, if you want to learn more about the services provided by Grailum Ltd go straight to the Help page or Support portal (you can access it by clicking on the mail icon in the footer) because the individual service pages won’t provide you with a lot of information. Nevertheless, the admins are regularly updating website visitors with the latest news in the cryptocurrency world regarding Bitcoin value (page “Updates”. Of course, the program has been online for a few days in total, therefore let’s see if the admins keep doing this in the future. But as always, the information on the website is enough to make a decision whether or not to invest. According to Alexa rank, currently, the main Grailum Ltd audience comes from Russia and Bangladesh. Of course, Alexa rank must be perceived only as a hint. Yet the admins have chosen not to use social media in their marketing approach. Therefore, it’s impossible to make any assumptions about the potential investors. Also, the website is only available in English. Like with other programs offering similar investment plans, Grailum Ltd on the internet is perceived very differently. Some are discussing the lifetime offer and content of the website, others are investing and sharing withdrawal info. I think that the exchange of views is still ahead in case the program will last. So, the most important – the investment opportunities. Unfortunately, an investment calculator is not available on the website or on the user dashboard, therefore everyone has to make their own calculations. Just to make it easier to understand what’s what here is a quick calculation for a standard investment. For example, an investment of $200 in Grailum Ltd (Level 1, 1.10% daily) would generate a daily return of $2.2. With 1.10% interest rate it takes 91 days to reach the break-even point. And 182 days to make a net profit of $200. The downside is that the minimum withdrawal is $10 (and withdrawals for BTC can contain only a three-decimal number), therefore you can withdrawal your profit once in approx. 5 days. Today we are looking at a new crypto trading program with long-term plans that seem to be realistic in terms of running a program for some time. However, everyone needs to decide themselves if the plans are beneficial enough to make an investment. The program itself and the website looks professional. How will this long-term HYIP work in the nearest future? It’s impossible to predict it. Therefore, remember that any HYIP is a high-risk investment and if you ever decide to make any investments, don’t invest more than you can afford to lose! Have you already made an investment in Grailum Ltd and have any useful information to share with us? Please drop a message in the chat box to share your experience! Investment plans: 1.1% up to 2.2 daily (forever). Initial deposit included in the payments.